Does anyone talk about stability anymore? For some, the idea is a distant memory. For younger people, they’ve known nothing but rapid change and shifting sands. “We live in a time when the notions of evolutionary or incremental change seem as much a relic of history as the Walkman and the typewriter,” writes Kerry Bunker in the introduction to On Leading in Times of Change. But if instability is the norm, then have you considered that some of your ideas about leadership and leading change may be outdated or insufficient? Or maybe you’ve been on auto-pilot as you manage wave after wave of change — and you feel a need for another approach. 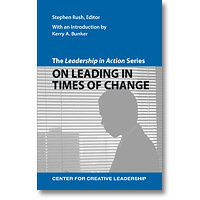 On Leading in Times of Change is the newest book in CCL’s Leadership in Action Series. It brings together different perspectives and practices that, together, offer a way for you to draw your own blueprint for leading change. The articles, originally published by CCL between 2000 and 2010, hit on a range of change themes, including adaptability, leading yourself and helping others manage transitions, facing crisis and adversity, and understanding what works and what doesn’t when it comes to organizational change.